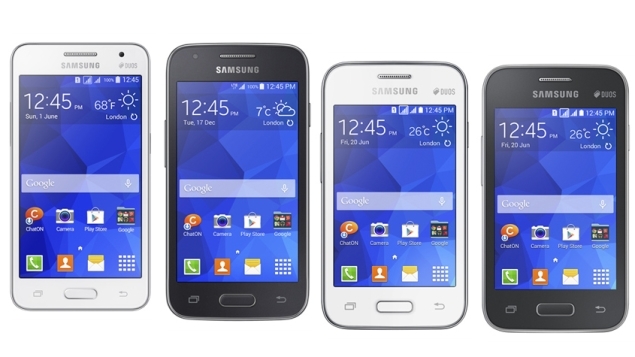 Samsung has launched four new affordable Galaxy smartphones - the Galaxy Core II, Galaxy Star 2, Galaxy Ace 4, and Galaxy Young 2. The newly launched Galaxy smartphones are touted to be targeted at the affordable segment. The South Korean consumer electronics giant, as of now, has not revealed any pricing or availability details of the four smartphones. Notably, all the new Samsung smartphones - the Galaxy Core II, Galaxy Star 2, Galaxy Ace 4, and Galaxy Young 2 - run Android 4.4 KitKat out-of-the-box with the company's TouchWiz Essence UI on top. Further, the Galaxy Core II, Galaxy Star 2, and Galaxy Young 2 are dual-SIM devices, while the Galaxy Ace 4 is a single SIM device and has been launched in 3G and LTE variants. The Samsung Galaxy Core II comes with a 4.5-inch WVGA (480x800 pixels) TFT display and is powered by a quad-core processor clocked at 1.2GHz. Other specifications include a 5-megapixel autofocus rear camera with LED flash; VGA front-facing camera; 768MB of RAM; 4GB of inbuilt storage; 64GB expandable storage support (via microSD card), and 2000mAh battery. Connectivity options on the smartphone include Wi-Fi b/g/n, Bluetooth 4.0, Micro-USB and 3G. The Galaxy Core II will be available in Black and White colour variants. It comes with dimensions 130.3x68x9.8mm and weighs 138 grams. It is the successor to the Galaxy Core launched in June last year. The Samsung Galaxy Ace 4, as mentioned earlier, comes in two variants - LTE and 3G. Both the variants of the Galaxy Ace 4 come with slightly different set of specifications. The Galaxy Ace 4 LTE comes with dimensions 121.4x62.9x11mm and weighs 130.3 grams, while the Galaxy Ace 4 (3G) comes with 121.4x62.9x10.8mm dimensions and weighs 123.8 grams. The LTE variant packs 1GB of RAM, while the 3G variant comes with 512MB of RAM. The Galaxy Ace 4 LTE is powered by a 1.2GHz dual-core processor and packs an 1800mAh battery. Meanwhile, the Galaxy Ace 4 (3G) is backed by a 1GHz dual-core processor and packs 1500mAh battery. Common specifications of the Galaxy Ace 4 3G and LTE variants are 4-inch WVGA TFT display, 5-megapixel rear camera, and VGA front camera. The smartphone comes with Bluetooth 4.0, Wi-Fi b/g/n, A-GPS, GLONASS, and Micro-USB connectivity options. Both the variants of the Galaxy Ace 4 will be available in Iris Charcoal and Classic White colours. The Samsung Galaxy Young 2 features a 3.5-inch HVGA (320x480 pixels) TFT display and is backed by a 1GHz single-core processor clubbed with 512MB of RAM. There is a 3-megapixel fixed-focus rear camera. It comes with 4GB inbuilt storage which is further expandable up to 32GB via microSD card. Connectivity options include Bluetooth 4.0, Wi-Fi b/g/n, A-GPS, GLONASS, 3G and Micro-USB. It measures 109.8x59.9x11.8mm and weighs 108 grams. The Galaxy Young 2 packs a 1300mAh battery and comes in two colour variants - Iris Charcoal and White. Lastly, the Samsung Galaxy Star 2 comes with a 3.5-inch HVGA (320x480 pixels). It is powered by a single-core Spreadtrum SC6815A clocked at 1GHz alongside 512MB of RAM. In addition, the Galaxy Star 2 and Galaxy Young 2 come with eight downloadable Gameloft games for users.